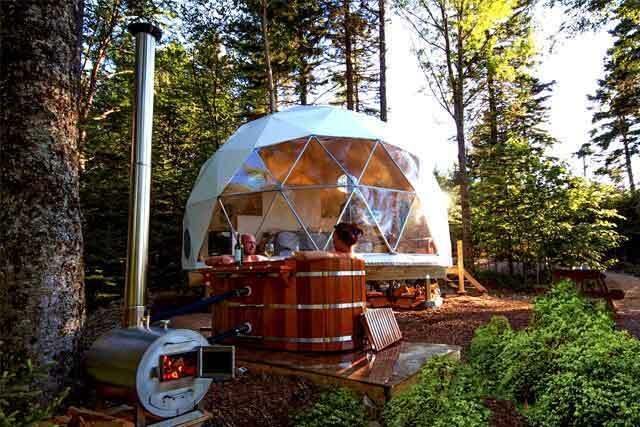 Troy and Sharon Edwards have two geodesic greenhouse domes on their property on the Sunshine Coast in Canada, where they grown their own food and manage their business Jes Urban Farms. Jes Urban Farms has a vision to inspire & help people to grow their own fresh food, year round and they believe the Tower Garden system is the solution! Meet Troy and Sharon, the dynamic duo behind Jes Urban Farms. The personal stories of these two green thumbs are rich with experience and passion for gardening and sustainable food production. Wherever these two lived, they would create some kind of a garden or if that wasn’t possible, would help out in their friends’ gardens. Together they have created Jes Urban Farms, located on the Sunshine Coast, BC to inspire, educate and sell vertical growing, Aeroponic Tower Garden® systems in both residential and commercial sizes. Since moving to the coast they have enjoyed both soil-based and Tower Garden® growing. Because of the increasingly unpredictable climate, the lack of affordable, arable land, water shortages in the summer, food being shipped long distances, (and the subsequent carbon impact), and especially the lack of locally grown food in the winter, Jes Urban Farms sought out solutions. They believe the answer to all these problems are solved using the Tower Gardens®. Troy Edwards was accepted into Canadian Chiropractic College in 1973 with a full scholarship, but he declined knowing his true calling was to be a commercial organic farmer and gardener.For the next 13 years he did both, north of Toronto and in Kamloops BC. While he has done many things over the years, he has always had his hands in the soil, maintaining a love and passion for the role that nutrient-dense food plays in optimal health. Growing up on a dairy farm and playing in her father’s small garden is the beginning of Sharon’s story. She was disconnected from gardening for a long period of her adult life and when she met Troy, was reintroduced to her passion for gardening. Growing food is ‘in her blood’ starting from a young age and Sharon loved bringing it back into her life. 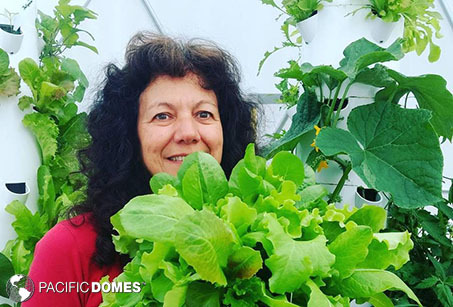 Sharon is so inspired and thrilled to be eating fresh food from the greenhouse domes throughout the winter months that she is eager to share this with others. When you enjoy food grown with aeroponics, you’re supporting a more sustainable future. As farmland and water supplies diminish, the human population soars. If conventional farming continues at the current rate, we’ll likely face major food and water shortages within 40 years. Compared to traditional agriculture, aeroponics uses 90% less water and 90% less space to grow more food, faster. Coupled with geodesic greenhouse domes, aeroponic growing towers are a modern day solution to a worldwide problem. Aeroponic farms and greenhouse domes can also operate in cities and other urban areas, making fresh, real food more available for all — now, and in the future. Tower Farms are already producing up to 2 million plants per year and grow 30% more food up to 3 times faster than traditional methods, using only a fraction of the water and land required by traditional farming methods. Geodesic greenhouse dome designs are not only highly efficient at distributing even air and temperatures throughout the greenhouse, they also mimic natures geometry and impart that into the plants grown withing them. 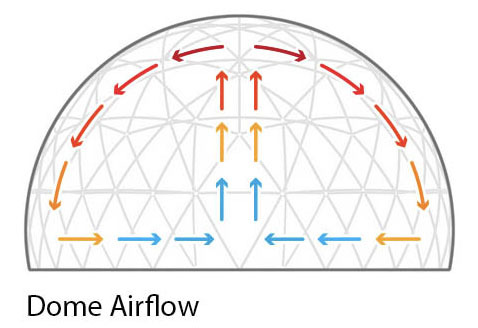 Domes are one of the strongest structures known, using the force of gravity to strengthen each section of the dome and holding up in extreme weather. 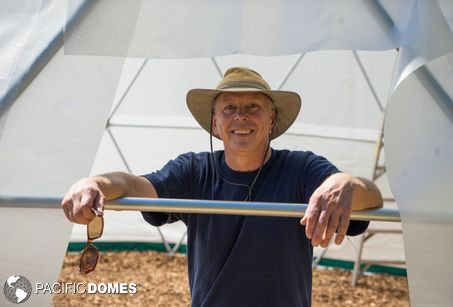 Troy says about the greenhouse domes, “We like the feeling of spaciousness and peace and calm in them.” The space is well used using Tower Farms-designed to be cost-effective to enable growing and scaling to meet local needs. You can include add-on systems that support reducing some of the manual aspects of the Tower Garden. 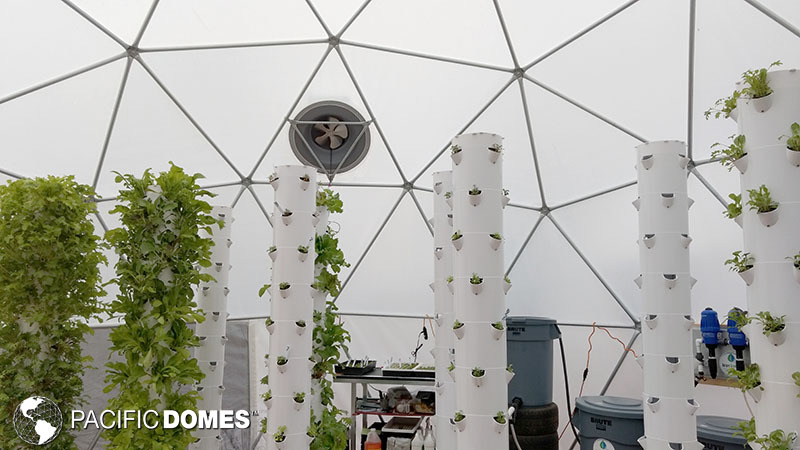 Together geodesic greenhouse domes and tower garden systems create an ideal, cost effective and sustainable gardening solution for both urban and rural farmers and are a solid solution for the future of farming and the planet.